Apple raised eyebrows during the original iPad unveiling when it casually noted that the new device would be using a new, Apple-designed System on a Chip named the A4. The company's future custom silicon plans are likely to expand even faster following its acquisition of Intrinsity, a privately owned ARM design firm. Since the original unveiling of the iPad, the company has outlined next to nothing about the actual specifications of the A4 SoC other than its 1GHz clock speed. "We have a chip called A4," Steve Jobs said on stage at the iPad event, "which is our most advanced chip we've ever done that powers the iPad. It's got the processor, the graphics, the I/O, the memory controller —everything in this one chip, and it screams." Little was publicly known about the A4 apart from the company's general mobile SoC strategy, which was detailed in reports published by AppleInsider starting in 2008. An expanding network of evidence documenting the company's efforts to design its own custom processors based on the ARM architecture and incorporating graphics and video cores from Imagination emerged over the course of the year. That same year, Apple had acquired PA Semi, a fabless chip design firm which had been working on advanced, specialized PowerPC processors. Immediately afterward, Jobs told The New York Times, "PA Semi is going to do SoCs for iPhones and iPods." With nothing of substance to report about the new chip, a variety of sources apparently began making things up based on supposition. The blog "Bright Side of News" published a report in late January that said the A4 includes the Cortex-A9 MPCore (identical to the processor in the nVidia Tegra and Qualcomm Snapdragon) and an ARM-designed Mali 50-series GPU core. At the end of February, Jon Stokes of Ars Technica refuted that earlier report, saying instead that the A4 was a single Cortex-A8 CPU and a PowerVR SGX GPU, adding that it "isn't anything to write home about." Stokes wrote that the A4 would skip on power by omitting camera processing features, making it unsuitable for use in a smartphone. Another report, appearing in The New York Times in February, stated that Apple, Nvidia and Qualcomm were all working to develop their own ARM-based chips before noting that "it can cost these companies about $1 billion to create a smartphone chip from scratch." Developing an SoC based on licensed ARM designs is not "creating a chip from scratch," and does not cost $1 billion, but the article set off a flurry of reports that said Apple has spent $1 billion on the A4. The real costs of designing a custom ASIC (an application-specific integrated circuit: a chip created by a company to serve a specific purpose rather than being a general commodity part intended for broad use by lots of customers) are closer to $10 million for all the related research and development, according to JC Rebic, a 15 year veteran of the semiconductor market. And with an ARM SoC, Apple clearly isn't beginning at zero in its design efforts. In its previous iPod and iPhone models, Apple has used commodity ARM SoCs because there was no real value in the company paying to create its own versions of these chips. This allowed Apple to focus on the hardware design, firmware, and client software layers of those products, which is where the company added value and differentiated itself from other MP3 and phone devices. Apple has long developed its own ASICs however, custom designing a variety of support chips from the original 68k-powered Macintosh to the chipsets of its PowerPC Macs. In fact, it was only in the transition to Intel that Apple began using off the shelf chipsets (which handle features such as I/O and memory management) from Intel in addition to Intel's CPUs. Soon after dramatically scaling back most of its ASIC team during the Intel transition in hopes that it could delegate that design role to its new partner, it appeared that Apple once again was itching to create more of its own custom silicon, if nothing more than to escape from Intel's pedestrian designs. Apple first partnered with Nvidia to use its innovative new single-chip chipset before Intel blocked the new partnership by tying its newest processors to its own related chipsets. The commoditization of the PC platform leaves some room for Apple to develop custom chips for its Macs, but in the mobile realm, the company has far more opportunities to differentiate its products. 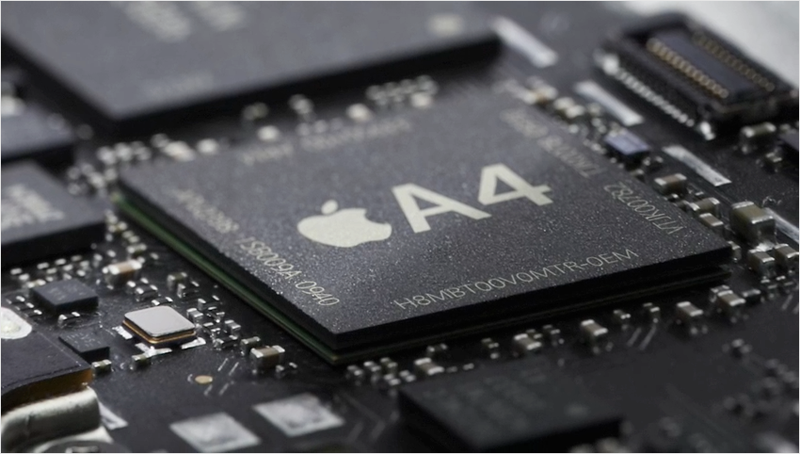 The A4 will demonstrate the success of Apple's choice to create its own SoC rather than relying on generic parts anyone can buy. Rebic explained that the cost of a chip depends on how many of the devices can be fabricated on a single wafer (a product of the chip's die size), and how many of those chips end up performing to the expected specifications (yield). It's customary for commodity chip makers like Intel to produce wafers of chips like the Core 2 Duo, and then test each to see how fast it can reliably work, and then sell the chips in quality batches (at different prices) based on their ability to run at designated speeds. Apple is creating the A4 for its own use, not to sell to third parties, so it has no need for creating different levels of rated speeds. It wants to create as many chips as possible from a single wafer, and wants them all to be able to run at 1GHz. Rebic estimated the cost of actually producing the chips at being less than $5 million, but the design cost would also include something like $30 million per year across 75 engineers, plus the $175 million Apple paid to acquire PA Semi. With all those costs involved, the advantages Apple gains from creating its own SoCs over simply buying them from Samsung do not appear to be that great, particularly for a device like the iPad that is only expected to sell in the low millions. However, as Apple ramps up its volumes, it can increasingly apply the economies of scale in the iPod/iPhone markets into making its custom SoCs cheaper and better. On the issue of cost, Apple can potentially improve its chip yields by taking its A4 parts that don't work correctly at 1GHz and reusing them in another product, such as the company's AirPort lineup of wireless routers, which already use ARM chips. Or, "for example," Rebic says, "take the A4 die, put it in a smaller (cheaper) package and reduce the clock (better yields) for an iPhone." The company can also weigh the option of simply creating a new scaled down design such as an "A3" that may be even cheaper to manufacturer (smaller die, better yields). Apple will also not face major expenses in continuing to improve upon or scale up the A4 design, as the actual silicon design and production costs are relatively minor as long as the company is producing a volume demand. Without any immediate, major cost savings, it appears Apple's primary motivation for developing the A4 was instead related to features and optimization. In addition to being able to leave off generic silicon devoted to doing things the iPad doesn't need to do (for example, many commodity chips aimed at smartphones incorporate hardware support for accelerating Java, something that neither the iPhone nor even Android make any use of; MP3 chips often include support for Microsoft's WMA and WMV codecs; and generic SoCs are likely to include I/O support for devices and interfaces the iPad simply doesn't have), Apple also has a rich repository of data to draw upon in creating fine tuned optimizations in its own processor. That's because Apple also develops its own operating system, web browser, Cocoa Touch development platform, and is intimately involved with the needs of its third party partners' fleet of more than 150,000 apps. This gives the company sharply focused insight into exactly which instructions are used most often, and allows it to incorporate custom support for hardware accelerating these tasks. Other hardware-based optimizations or customizations Apple may be adding to the A4 or future iterations of its custom SoCs include additional acceleration for codecs or data encryption, sophisticated power management, and security modules that make it more difficult to subvert the kernel's security model via "jailbreaking." Apple is opposed to jailbreaking because the company says it results in floods of error messages and user dissatisfaction, in addition to enabling widespread app theft that could undermine the App Store's very successful model of secure, low cost mobile software via high volume sales. In keeping with the company's evident large scale, long term plans to build its own custom SoCs, Apple is rumored to have bought Intrinsity, a privately owned ARM design firm which is "particularly well known for its low power static design techniques," according to a note published by Electronics Design, Strategy News. The report described Intrinsity as "an EDN Innovation Award finalist in both the microprocessor and Innovator categories," and said the company "might be the CPU core technology provider for the A4." More details about Apple's relationship with Intrinsity, and the still hidden specifics of the A4 itself, should be revealed this weekend when the iPad goes on sale to the general public.